Next weekend the German Kart Championship is going to travel across the border. 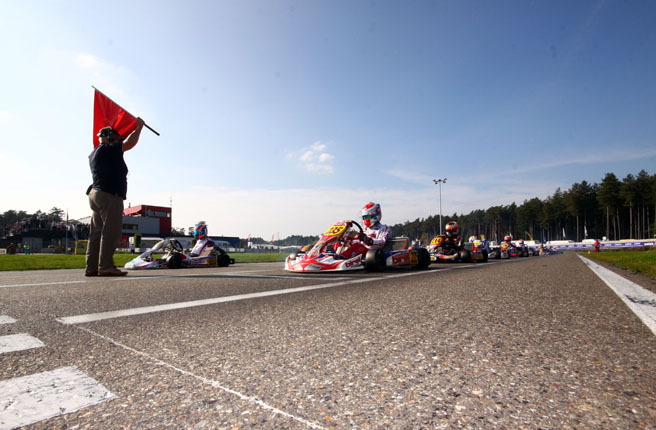 In Belgian Genk the ranked races three and four of the highest German kart racing series are going to take place. With just under 130 drivers the fields of the three grade series DKM, DJKM and DSKM are brilliantly manned. At the beginning of May the kick-off to the German Kart Championship 2015 took place at the Prokart Raceland Wackersdorf. In changing weather, the drivers showed thrilling races. Six weeks later there is now going to be a new edition. In Genk the next victories and championship points are going to be dealt out at the second event. The track which is located 50km from the German border is on the racing calendar of the highest German kart racing series for the fifth time and is taking place in the summer for the first time. Due to the finale of the CIK-FIA KZ and KZ2 European Championship which is going to take place in the middle of July, the fields of participants show an impressive quality. The DSKM is well filled with 65 drivers and the DKM and DJKM also count more than 30 drivers respectively. Menno Paauwe (Paauwe Kart Racing) is going to travel to Belgium as the overall leading driver at the shifterkarts. The BirelART driver showed a great catching-up race in Wackersdorf and finished the weekend as the winner. Right behind him is Maik Siebecke (SRP Racing Team), the best German driver. The Hanover resident is sharing the second place with Jorrit Pex (PEX Racing Team) who has the same amount of points. In Genk, the karts are going to be dealt anew. Due to 29 guest drivers, among them the Belgian local hero and reigning European Champion Rick Dreezen (KSW Racing Team), there are new victory aspirants. Only the best 34 of 65 drivers are going to enter the final races on Sunday. Thrilling fights are also expected at the juniors again. In Wackersdorf the field was very close together and there are up to ten favorites now. Max Hesse (RS Motorsport) is going to start as the race leader – the ADAC Sports Foundation’s sponsored driver showed the most constant performance in Upper Palatine. The competition is strong though: his direct followers Luca Lippkau (RMW Motorsport), Bent Viscaal (KSM Motorsport), Max Tubben (CRG Holland) and Felix Arnold (ADAC Hessen-Thüringen e.V.) are only four championship points apart. At the DKM, Dutchman Richard Verschoor (RB Racing SA) achieved a perfect debut. Due to a double victory he achieved the overall lead and sent reigning champion Martijn van Leeuwen (CRG Keijzer Racing Team) to second place. Both know the 1.360m long track in Genk really well and are huge favorites for the race victories there as well. Nicolai Kjaergaard (TK Racing) is currently on third place in front of Will Stowell (CRG Keijzer Racing Team) and Christian Soerensen (Strom Development). Best German driver is TB Motorsport-protégé Tom Lautenschlager on sixth place. The field of participants is going to be upgraded due to strong guest drivers. 2012s junior champion Hannes Janker (TB Motorsport Racing Team) is going to start as well as CRG-factory driver Felice Tiene (CRG Holland) and Belgian Benjamin Lessennes (CRG Keijzer Racing Team). In Genk, the new CIK-FIA front fairing mounting kit is going to be used for the first time. After additional tests in the context of the European Championship in Portimao and Zuera the system is now also going to celebrate its premiere at the DKM. There are also changes regarding the Vega unit tires: these cost 190€ per set from Genk on. From Saturday morning on, everything happening in Genk is going to be broadcast via DKM online live stream again. More than 16 hours of live images can be viewed by kart racing fans at home. It’s going to start on Saturday at 10:35am with qualifying – the finals are going to start Sunday at 10am.